A perennially eager market exists for commentaries which promise to shed light on the complexities of a Greek text. Holden’s edition of Plutarch’s Pericles, with text and commentary, and intended for the intermediate/advanced student, will not completely serve the intermediate undergraduate who is somewhat shaky on fundamentals. This commentary can be used with profit, however, by the advanced student of Greek who knows Latin. It provides vocabulary assistance with some of the glosses in Latin (and here and there in French and German); parallel Greek passages are cited throughout; cruxes receive critical elucidation. The text is accompanied by an apparatus criticus and marginal notes in English. 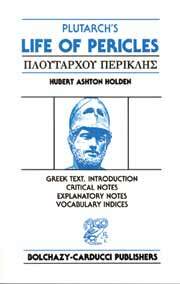 An extensive introduction with references in Greek, Latin, and English support Holden’s basic assertions concerning Plutarch’s life and influence, the aim, purpose, and chronology of the Parallel Lives, and sources for the Pericles. Note, however, that Holden’s book was originally published in 1894 and has been reprinted unchanged. Subsequent scholarship on Plutarch, therefore, is not reflected. The introduction concludes with a useful ‘Chronology of Events in the Life-Time of Pericles’ and an ‘Addenda et Corrigenda’ concerned with textual matters. Four indices complete this volume.